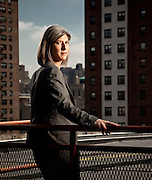 Portraits of Lauren Zalaznick, Pres. of NBC Universal Women & Lifestyle Ent. Lauren Zalaznick, President of NBC Universal's Women and Lifestyle Entertainment Networks. Photographed on the roof of the Oxygen Networks building for Fortune Magazine.